1.1 What’s a Raspberry Pi? 1.1.1 Can I buy shares in the Raspberry Pi Foundation? 2.1 Where can I buy one? 2.2 How many can I buy in one go? 2.4 How can I pay for it? 2.5 What will I get when I buy one? 2.6 Why is the price in US Dollars? You’re a UK company! 2.7 Will there be a buy-one-give-one program? 2.8 Will the device be available internationally? 2.9 How much will it cost to ship to [country X]? 2.10 Will there be a minimum order quantity? 2.11 Do you accept pre-orders? 2.12 I want to be a Raspberry Pi reseller. 2.13 Can I join the mailing list? 3.1 What’s the difference between Model A and Model B? 3.2 What are the dimensions of the Raspberry Pi? 3.3 What SoC are you using? 3.4 Why did you select the ARM11? 3.5 How powerful is it? 3.8 How does it boot? 3.9 Where’s the on / off switch? 3.10 Why is there no real time clock (RTC)? 3.11 Will you sell a self-assembly kit? 3.12 Can I add extra memory? 3.13 What hardware documentation will be available? 3.14 But I want documentation for <hardware X>! 3.15 But I demand the documentation for the chip. Give it to me! 3.16 Why doesn’t the Raspberry Pi include <insert name> piece of hardware or <insert name> sort of port? 3.17 Can you test it to make sure that it is suitable for <X>? 3.18 How do I connect a mouse and keyboard? 4.1 Will it have a case? 4.2 Will it fit in an Altoids tin? 5.1 What display can I use? 5.2 Why is there no VGA support? 5.3 Is there a GPU binary? 5.4 Can I add a touchscreen? 5.5 What is the usable temperature range? 6.1 Is sound over HDMI supported? 6.2 What about standard audio in and out? 7.1 What are the power requirements? 7.2 Can I run power Raspberry Pi from batteries as well as from a wall socket? 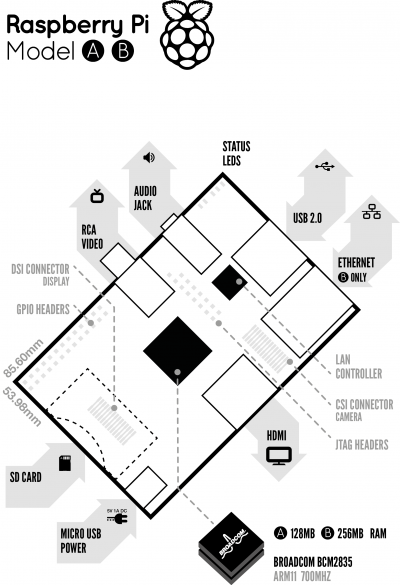 7.3 Is power over Ethernet (PoE) possible? 8.1 What operating system (OS) does it use? 8.2 Does it have an official programming language? 8.4 What Linux distros will be supported at launch? 8.5 Will it run Android? 8.6 Will it run <insert name of program here>? 8.7 Will it run the new Windows RT? 9.1 What happens if I brick the device? 10.1 Does the device support networking? Is there Wi-Fi? 10.2 Will there be a WiFi option? 10.3 Why no Gigabit Ethernet? 10.4 Does the device have support for any form of netbooting or Pxe? 10.5 How do you connect more than two USB devices? 11.1 What educational material will be available? For the first batch we limited orders to one per person. This was to prevent eBay scalping (to some extent – we also auctioned some boards ourselves to try to make sure there’s no market for scalpers), and ensure that as many different individuals as possible got their Raspberry Pi! The Model A costs $25 and the Model B $35, plus local taxes and shipping. The distributors accept most major cards, PayPal, and offline payments. A Raspberry Pi. Leads, a power supply, case or SD cards are not included but can be purchased from any of the Raspberry Pi vendors: Premier Farnell/Element 14 and RS Components. You can build an operating system on your own SD card or buy one preloaded with Raspian "wheezy" from the same source. Why is the price in US Dollars? You’re a UK company! The components we buy are priced in dollars, and we negotiate manufacturing in dollars. Because currency markets are so volatile at the moment, we price the final board in dollars too, so we don’t have to keep changing the price. Will there be a buy-one-give-one program? Yes. We plan to implement a program of this sort, but you can also just buy one if you prefer. Will the device be available internationally? Premier Farnell/Element 14 and RS Components distribute and ship world-wide via subsidiaries and partners in virtually every country. There have been some problems with information about pricing and availability being fully shared among some countries' local offices, but, they are being worked out with the primary distributors and should be resolved by mid-March 2012. Premier Farnell/Element 14 and RS Components and their subsidiaries/partners will convey this information before orders are charged, and these costs may vary from country to country, which the Foundation cannot control. Will there be a minimum order quantity? The minimum order quantity is one unit. The maximum order size restriction has been lifted. We are not taking requests for people to be resellers at the moment. However , nothing stops your buying devices from the distributors and reselling them with accessories. You certainly can. Head to the home page, and you’ll see a form at the top right you can fill in. People who are signed up will get an e-mail as soon as we have confirmed a release date. Model A has 256 MB of RAM, HDMI, one USB port and no Ethernet (network connection). Two revisions of the Model B exist. The first (now referred to as revision 1) has 256 MB RAM, HDMI, two USB ports and a 100 Mbits/sec Ethernet port. Model B revision 2 has 512MB RAM with the same ports. The SoC is a Broadcom BCM2835. This contains an ARM1176JZFS, with floating point, running at 700Mhz, and a Videocore IV GPU. The GPU is capable of BluRay quality playback, using H.264 at 40 Mbits/s. It has a fast 3D core accessed using the supplied OpenGL ES 2.0 and OpenVG libraries. Why did you select the ARM11? The GPU is capable of 1 Gpixel/s, 1.5 Gtexel/s or 24 GFLOPs of general purpose compute and features a bunch of texture filtering and DMA infrastructure. That is, graphics capabilities are roughly equivalent to Xbox 1 level of performance. Overall real-world performance is something like a 300MHz Pentium II, only with much, much swankier graphics. There’s a little overclocking headroom – most devices will run happily at 800MHz. There’s no BIOS per se, but we do support booting bare metal code, so something could be done. Will you sell a self-assembly kit? Broadcom don’t release a full datasheet for the BCM2835, which is the chip at the heart of the Raspberry Pi. We have released a datasheet for the SoC which covers the hardware exposed on the Raspi board e.g. the GPIOs. We also have released a board schematic . But I want documentation for <hardware X>! Other documentation may be released in future but this will be at the Foundation’s discretion. Why doesn’t the Raspberry Pi include <insert name> piece of hardware or <insert name> sort of port? Our main function is a charitable one – we’re trying to build the cheapest possible computer that provides a certain basic level of functionality, and keeping the price low means we’ve had to make hard decisions about what hardware and interfaces to include. Can you test it to make sure that it is suitable for <X>? If you want to use it for something that we haven’t tested, and that it’s not intended for (i.e. anything but the educational work we’re planning for it), then that development work is up to you. Model A has one USB port and Model B has two. Beyond this, mice, keyboards, network adapters and external storage will all connect via a USB hub. Will it have a case? Not for the first batch. We’ll be making and selling cases by the summer; you'll be able to buy a unit with or without a case, or a case on its own. The education release later in 2012 will have a case by default. There are lots of homebrew case discussions on the forum. Will it fit in an Altoids tin? Doesn’t quite work, I’m afraid – because we don’t round off the edges of the board, it’s a little too big to fit the tin. There is composite and HDMI out on the board, so you can hook it up to an old analog TV, to a digital TV or to a DVI monitor (using a cheap adapter for the DVI). There is no VGA support, but adaptors are available, although these are relatively expensive. The device is powered by 5v micro USB. You can read more about it here. Power supplies will be available at launch. Yes. The Model A should run well off 4 x AA cells. It is capable of running several different operating systems. 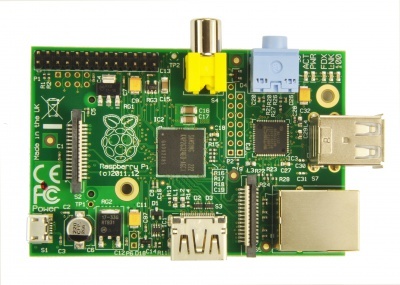 As of July 2012, the Foundation recommmends Raspbian "Wheezy" for first-time users. It’s straightforward to replace the root partition on the SD card with another ARM Linux distro if you want to use something else. The OS is stored on the SD card. Fedora, Debian and ArchLinux will be supported from the start. We hope to see support from other distros later (because of issues with newer releases of Ubuntu and the ARM processor we are using, Ubuntu can’t commit to supporting Raspberry Pi at the moment). You will be able to download distro images from us as soon as the Raspberry Pi is released, and we will also be selling pre-loaded SD cards shortly after release. If someone in the community can port a version of Android to work with 256MB of RAM, then it’ll run on the Raspberry Pi. Will it run the new Windows RT? We have tried cards up to 32GB and most cards seem to work OK. The Wiki has more information about which makes and models work best. You can also attach a USB flash memory stick or USB hard drive for storage. The Model B version of the device includes 10/100 Mbits/second wired Ethernet. There is no Ethernet on the Model A version (which we expect to be taken up mostly by the education market), but Wi-Fi will be available via a standard USB dongle. Will there be a WiFi option? Not in the first version, though you can add a dongle. ARM Linux WiFi support can be a bit patchy; there’s a list of tested dongles on the wiki. No. However, it’s such a low-power device that we expect it to be left on much of the time! Use a hub to increase the number of ports. Some keyboards have hubs built in which would work well. What educational material will be available? We’re working with partners to get software materials developed, as well as with the open source community. Computing at School is writing a user guide and programming manual, we’re aware of a few books being planned and written around the Raspberry Pi, and others have already started to produce some excellent tutorials including video. We’re also working with partners to use it as a teaching platform for other subjects, including languages, math, and so on. Once we launch, we hope that the community will help organizations like Computing at School put together teaching material such as lesson plans and resources and push this into schools. In due course, the foundation hopes to provide a system of prizes to give young people something to work towards. There’s lots of discussion of educational uses and resources in our forums – come and have a chat! SoC: System on Chip. A computer on a single integrated circuit. GPIO: General Purpose Input/Output. Pins that can be programmed to do stuff. GPU: Graphics Processing Unit. The hardware that handles 3-D graphics in scientific notation (floating point) math. Distro: a specific package (“flavor”) of Linux and associated software. Brick: to accidentally render a device inoperative by making changes to software or firmware. Pxe: Preboot execution environment. A way to get a device to boot via the network. This page was last edited on 9 April 2013, at 15:39.